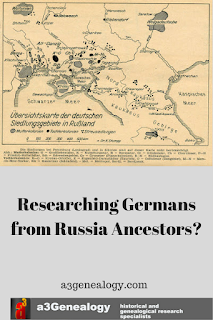 a3Genealogy: Researching Germans from Russia Ancestors? 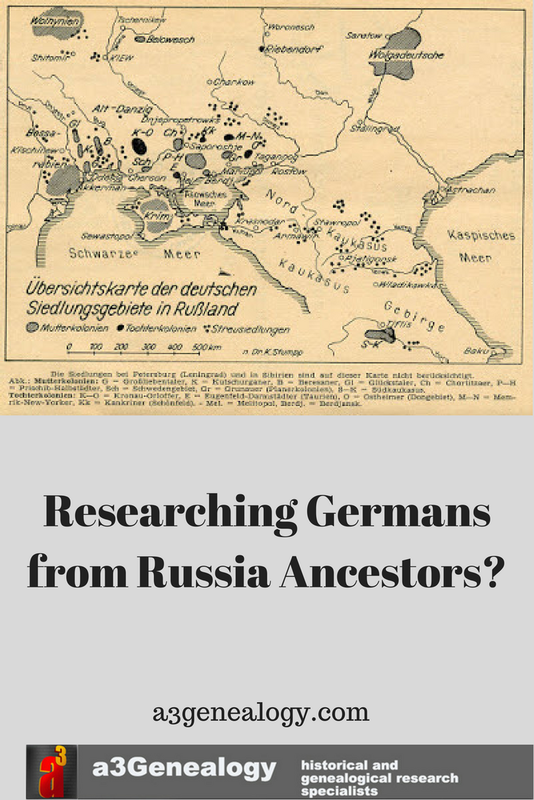 It wasn’t long ago that the a3Genealogy research team delved into the family history of a German family from Russia. In spite of being faintly optimistic, the research project was a success; a family story was uncovered, and supporting documents were unearthed. Here are a few tips to ferret out your German ancestors who lived in Russia. Learn the history. There are many books and internet articles on the colonization of the Lower Volga and the German settlements along the Black Sea. But if you want a quick overview here’s an introduction to Germans from Russia. Know that “thousands of people left Russia for Kansas in the 1870s and established large settlements in central Kansas from northern Topeka to Russell County.” By understanding the history and migratory paths, researchers may uncover likely repositories of family documents. 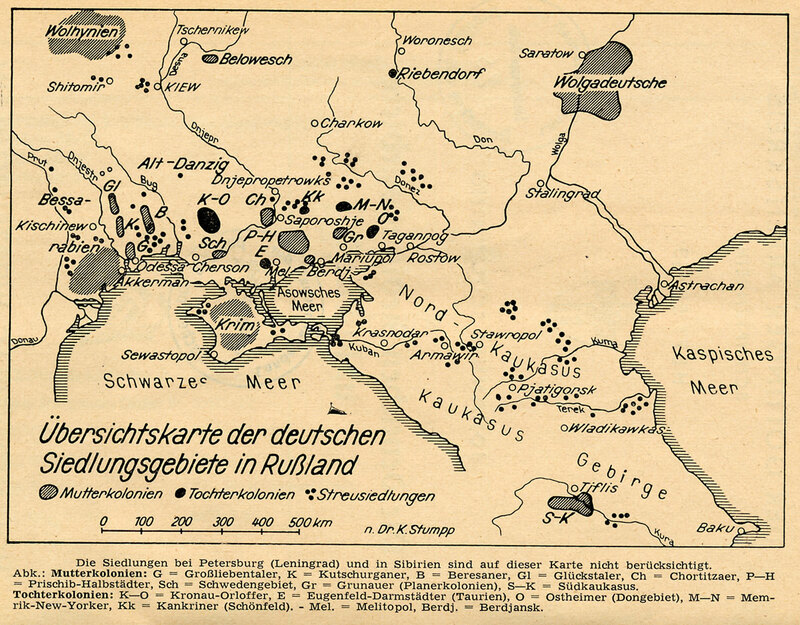 Identify the approximate German Settlements on a settlement map. Be sure to understand the Colonization of the Lower Volga, and know that about 1/3 of the Germans died before reaching Russia. But even with those dire numbers by 1870 approximately 450,000 Germans had settled in Russia. By 1914, there were over 2.4 million. 1872-1873 Several groups emigrate from the Odessa area to Nebraska and the Dakotas. Scouts from other Black Sea colonies and the Volga colonies investigate opportunities in America. 1874 The Imperial Russian government amended the 187l decree and instituted compulsory military conscription of German colonists immediately. 1874-1914 Thousands of German colonists emigrated from Russia to North and South America. 1917 Political unrest in Russia lead to two revolutions and the beginning of Soviet communist rule. 1919 The United States government enacts strict immigration laws which greatly slowed entrance of immigrants. Canada continued to receive German immigrants from Russia. 1920-1923 Famine in Russia. Over l50 thousand Volga Germans died of starvation. 1928-1940 German farms and property were confiscated by the state and forced onto collective farms. 1939-1945 The Second World War. Germany at war with the Soviet Union. Germans were persecuted and many moved to Siberia and central Asian republics. Many fled to Germany. 1992-1996 Many Russian Germans emigrated to recently unified Germany where they were offered citizenship. 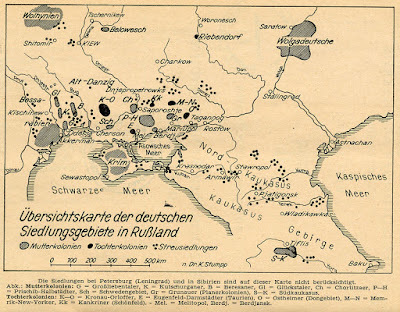 Archives and repositories that may assist with your Germans from Russia research. American Historical Society of Germans from Russia (AHSGR). Membership to this organization may prove to be quite valuable. Be sure to visit the website as there is a collection of online resources to include over a half million ancestor list entries. Researchers may even stumble across their ancestors surname in the Ancestral Surname Chart Index leading to a surname chart prepared by Dr. Igor Pleve. Be sure to also scour the journals, articles, and the passenger list index. Germans from Russia Heritage Society. This site has an impressive members only Genealogy Database and Letter Archive. Center for Volga German Studies at Concordia University, Portland. Be sure to check out the 2016 planned conferences, workshops and seminars held in cities across America – from California to Pennsylvania. This informative website also posts German Origins for Volga German families. Is your family listed? Norka A German Colony in Russia. This website has samples of their online audio and photo collections. United States, Obituaries, American Historical Society of Germans from Russia, 1899-2012, hosted by FamilySearch.org. Black Sea German Research. Was your family a German who settled along the Black Sea vs the Volga? If so, be sure to visit this website as it hosts a database of over 2 million names. North Dakota State University (NDSU) Heritage Collection. Although there are many local collections and repositories, the a3Genealogy researchers enjoy the one-stop resource of NDSU. The links provided may prevent a family researcher from hours of trawling the internet. The Federation of East European Family History Societies (FEEFHS). Did your German from Russia settle in Canada? This is a good place to begin your ancestral journey. The FEEFHS website offers about 20 resources for your Germans from Russia Canadian settlers. Germans Emigrated to Russia - Odessa. This 2010 a3Genealogy blog post is filled with history and helpful links. Ryan Zachmann from Russell Kansas, a descendant of Volga Russians (and based on surname Zachmann may be Black Sea Germans on his paternal side). Ryan, my “seat-mate” on a flight to Kansas, reminded me that this blog post could be useful. National Archives - Kansas City staff sponsored presenter Mike Meisinger, a Village Coordinator for AHSGR. As mentioned this organization houses a wealth of information.